Janis’ background is varied but has always been related to art. She taught in high schools in Venezuela and southern California, and in Santa Barbara she had a design business providing color and art for architecture. She worked for a large architecture firm in Houston where she was in charge of decorative arts. That work involved designing murals and banners, architectural graphics, and fabric design. Both Design Tex and Maharam Fabrics of New York later carried the fabric designs. Some years later, Janis had a design studio on Union Street in San Francisco that featured her painting and soft sculptures, which she called her ‘Ladies of Delight.’ She moved to Boston in 1997 where she became an artist member of the Marblehead Art Association of South Shore Art Center, in Cohasset, just south of Boston. Janis was fortunate to have opportunities to take numerous classes and workshops – Harvard Extension courses, the Museum of Fine Arts of Boston classes, Koo Shadler’s egg tempera instruction, and Sarah Roche’s classes in botanical illustration. 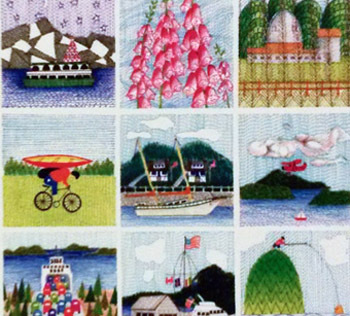 A dozen or more of her paintings have been translated into needlepoint canvasses that are available on Cape Cod.